Kpah Matadi, at 6 feet tall and 235 pounds, is a momma's boy. Matadi tried to be a role model for his siblings as his mother dealt with moving and struggled to find a job. Matadi has always tried to be the best he can be for his family. Matadi's family moved from Monrovia, Liberia, when he was just 5 years old. He doesn't remember much except learning to ride a bike, the dust from the roads and lots of sun. Matadi, his parents and his two siblings stopped in two different countries on their way to the United States in hope of a better life. Matadi didn't adjust quickly. His first American experience was eating rice, which he quickly threw up. Matadi lived in the Philadelphia area for the next few years. His part of town was safe, he said, but he consistently heard of shootings and gang violence. Matadi's father, a truck driver, made a visit to Fargo and loved it. So again Matadi's family started from scratch and moved to West Fargo when he was a sophomore. Matadi felt isolated in a much quieter Midwestern city. Then Matadi found his place with football and track and field. Now a West Fargo senior, Matadi is among the state's top shot put throwers, started for the Packers' state championship football team and was this school year's homecoming king. 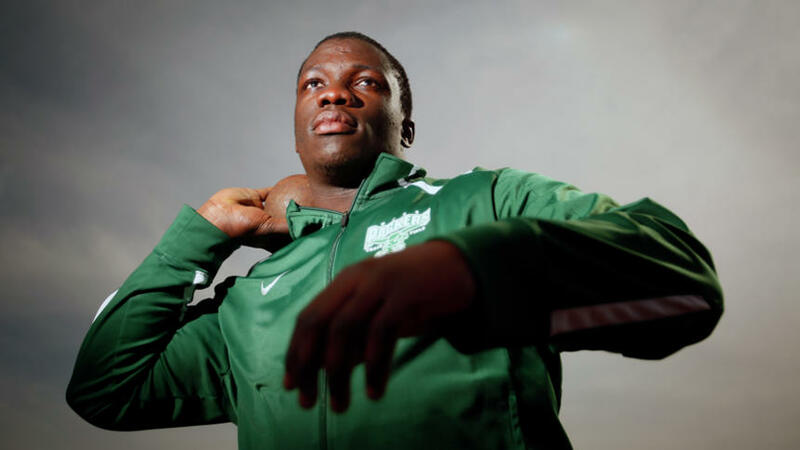 During the track and field season, Matadi tied the first-place mark at the North Dakota Class A state indoor track and field meet but ultimately took runner-up with a throw of 52 feet. "I just have to do everything in my power," Matadi said. "And hopefully one day it will pay off." Matadi still keeps in touch with family back in Liberia and hopes to visit sometime soon, even if hardly anyone there will recognize him. Matadi believes he got his work ethic and values from his roots. He's tried to carry that determination everywhere he's gone with everything he's done. "We definitely hold our cultural values of just working hard and staying focused on our goals, to make a better life for us and our futures," Matadi said. "Without hard work, you won't be anywhere. Some people have skills but won't work hard and they won't live up to their potential. If you work hard, you'll go places." Matadi, who played right guard for the Packers, is also known for his smile and positive energy. When the Packers were down on themselves after trailing during halftime of the Class 3A state football championship, Matadi was cheering up his team. The Packers rallied to win the state title. "We started panicking," Matadi said. "But for me, I knew it was a game. It takes time. You settle down, don't give into the pressure and stay positive. "It's like throwing a shot. If your last one wasn't good, you don't get down on yourself because the next one isn't going to be as bad as the last one. It worked out." Matadi's friends convinced him to play sports when he came to West Fargo. He admits he was pushed to the ground the first time he played football and struggled to throw a shot put a fraction of what his peers were. But sports helped him socialize. "From the first time I held a shot put, I just liked it," Matadi said. "I just stuck with it." Fellow senior thrower Elijah Gulland, who played left guard opposite of Matadi in football, said Matadi keeps everyone on track and pushes the team to keep improving. "You could tell right away he was going to be something special," Gulland said. "He's just got amazing strength and willingness to learn and improve. That's hard to find." Packers head track and field coach Darin McKinnon said Matadi was raw with his technique early on but kept improving. McKinnon said Matadi is a role model and is everything he wants in an athlete. "The sky is the limit," McKinnon said. "He can really go even further. We hope he hasn't even gotten close to being at his peak yet." Gulland said Matadi is "the friendliest guy you'll ever meet" and winning homecoming king is a testament to his likeability. Matadi has now worked himself to better throws than Gulland, but Gulland just wants to see Matadi keep getting better. "He's a competitor, but most of all he's a good teammate," Gulland said. "He's always bringing people together, trying to get people to push through." After Matadi finished in the top eight at last year's Class A state meet, McKinnon hasn't been surprised by Matadi's season. While Matadi has impressed McKinnon with how quickly he's developed, Matadi's dedication to weight training made McKinnon believe improvements would come. McKinnon said he still has technical tweaks to make but trusts he'll keep working at it to put out his best throw by the season's end. "Everything with him is so positive," McKinnon said. "He's always got a smile on his face. With that smile, how can you be around him and not just be in a positive mood? That's what he brings for us." Matadi has countless memories from sports that he feels he could talk about for days. He hopes to make the most of those memories and time he's spent in practices by winning state this year. Matadi then plans on going to North Dakota State after high school and wants to keep working so he can walk on for the Bison track and field team. Ultimately, Matadi's goal is to reach his full potential, whatever or wherever that is.